When I began serious Eggleston genealogical research, I learned to look to earlier research first. It is always a good idea to check what has been done, so as to not waste time and effort. Unfortunately, I found that some earlier work was not correct. Errors and false assumptions had been perpetuated by those who accepted earlier works without necessarily thinking things through or further checking. My Great-grandfather Orson H. Eggleston gathered genealogical information while serving a Mission for the Church of Jesus Christ of Latter-day Saints in Michigan in 1876-77. Apparently while there he corresponded with someone in New York City about the Eggleston family. He included this copy of a response with a letter to his father, seeking his father’s advice on how to respond. He seemed hopeful that this Nicholas would have helpful information. I am not sure what happened with this, but it does indicate how early Orson tried to learn more about the larger Eggleston family. 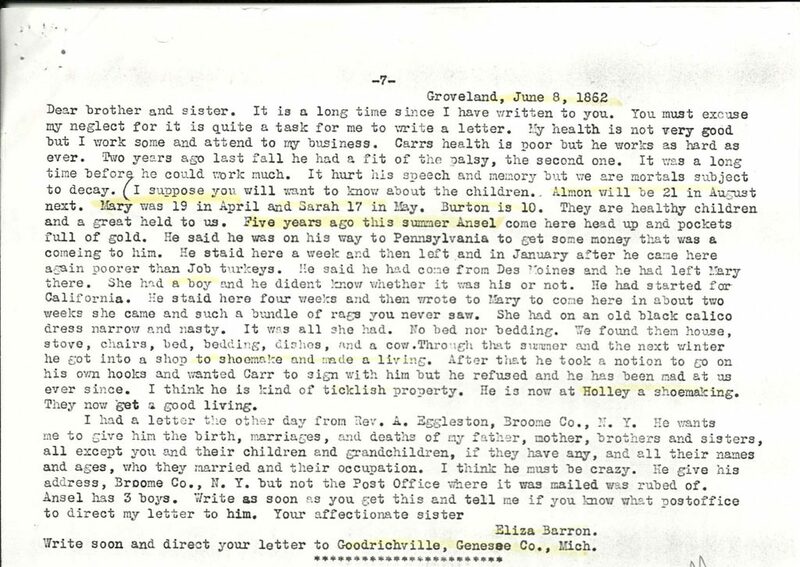 In an earlier family letter Eliza Barron told her brother Samuel Eggleston about a letter she had received from Rev. A. Eggleston of Broome County, New York. He was requesting information about family members, including birth, death and marriage dates. Eliza seemed skeptical of his intentions and unsure of his address. It is not known what response Samuel gave her or if she ever sent any information to this person. This would have been the Ambrose mentioned in this letter from Melville, who apparently had been researching and collecting information on the Eggleston family.